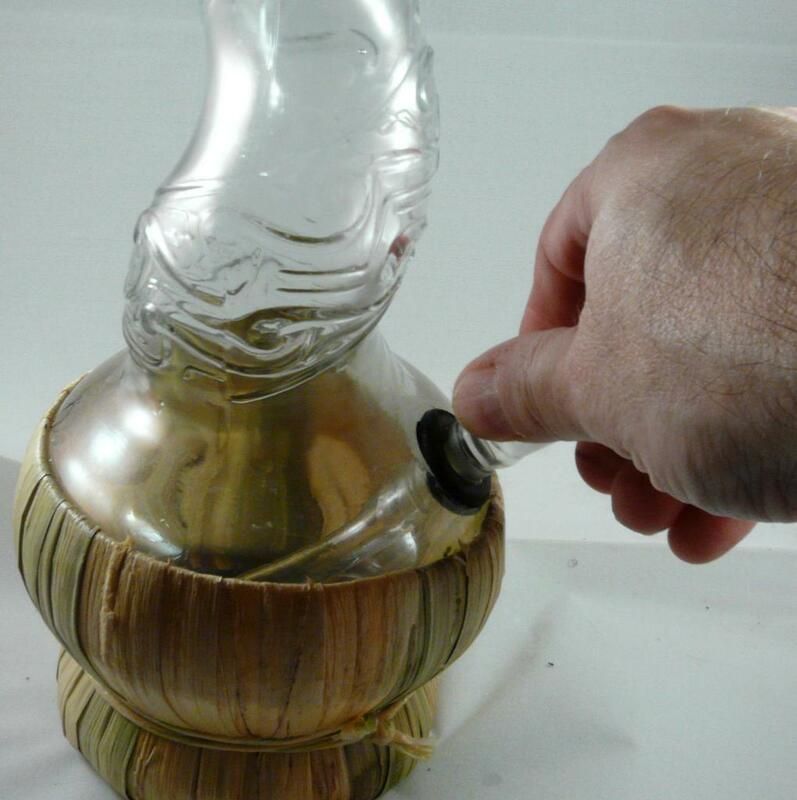 In the previous installment of How To Make Your Own Glass Bong, you picked out your liquor bottle and ordered the special diamond bit to cut the hole in it. Somewhere between then and now, you’ll have to empty that bottle, but I’ll leave that up to you 🙂 Right now, you have just a few things left to get, and luckily, they shouldn’t take long. As much as I like to say “Support Your Local Head Shop”, I tried. They didn’t have anything I needed in stock, and if they did it would have cost $50 minimum just for the parts. So I dug around on the web, and found something even better: Free Glass!!! That’s right, GlassblowersDirect sells all kinds of cool stuff, and one of their offers is a free (diffused!) downstem for new customers. You will need both a special hard-to-find downstem to fit the Bottaro bottle, as well as an actual bowl (to smoke out of! ), so you can order both those things and only pay for one (plus shipping, which is incredibly quick). I don’t have any connection to them, just found them on the web and they seem to really have their act together, except for their slightly funky credit card ordering system (it’s secure through Paypal, they just haven’t hooked it to their website so they manually send you a link). If you want any other colors, customization, or accessories (nail domes for dabbers! ), scroll around that page and choose them now, while you’re already paying for shipping (they use heavy-duty boxes and lots of bubble wrap). Remember, you need all 14mm stuff here. 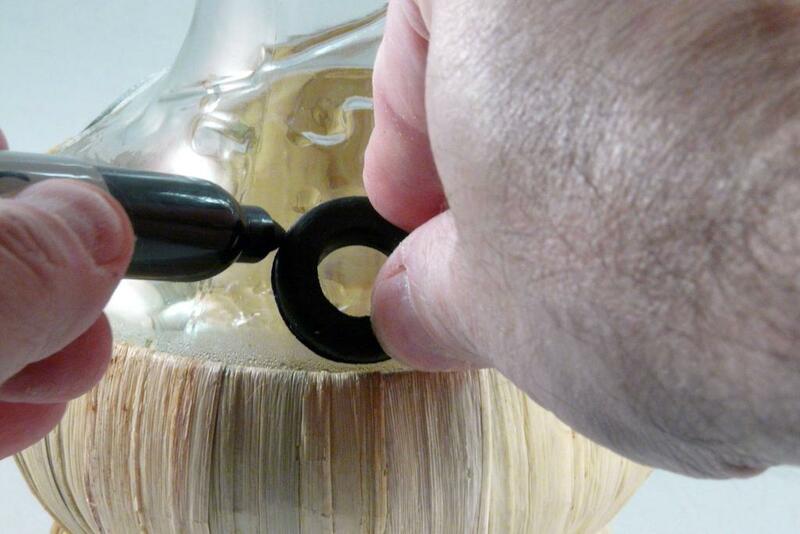 If you’re using any other bottle than the Bottaro, you’ll have to measure it for the downstem. There are very detailed instructions on the GlassblowersDirect website, and these guys carry downstems in every quarter-inch increment between 3″ and 10″, so it’s a good place to know about in any case. The magic in this case is a little rubber grommet that just happens to fit exactly into a 3/4″ hole and whose inside is just tight enough to grip the lower ground glass portion of the downstem securely. The rubber also shock-mounts the downstem while sealing the connection so air or smoke don’t escape. How much is this miracle? Just 75 cents at your local Ace Hardware! Here is what you want for your grommet: ID 1/2″, OD 31/32″, groove 3/4″, stock 55059 (the link actually goes to Ace’s supplier and shows you what they look like, but any grommet will do as long as it’s the same groovy size :-). My local Ace carries these in their electrical department, but you should be able to find one of these in any decent hardware store. WARNING: Please read all steps carefully, and if possible print them out as a checklist, before starting work. Put the diamond bit/hole saw into your battery-powered drill (do not use a plug-in drill for reasons that should be obvious shortly). Most typical household or commercial drills have two ranges; set yours to “high”. In any case, you’re looking for somewhere between 600 and 1000 rpm. Put on some safety equipment, since little pieces of glass will be flying around. At the very minimum, you should wear safety goggles or some sort of full eye protection. Protective gloves are nice too. Drilling glass creates a lot of heat, so we’re going to be cooling the area by running water over it (this is why you must use a battery drill; AC power and water do not play well together). 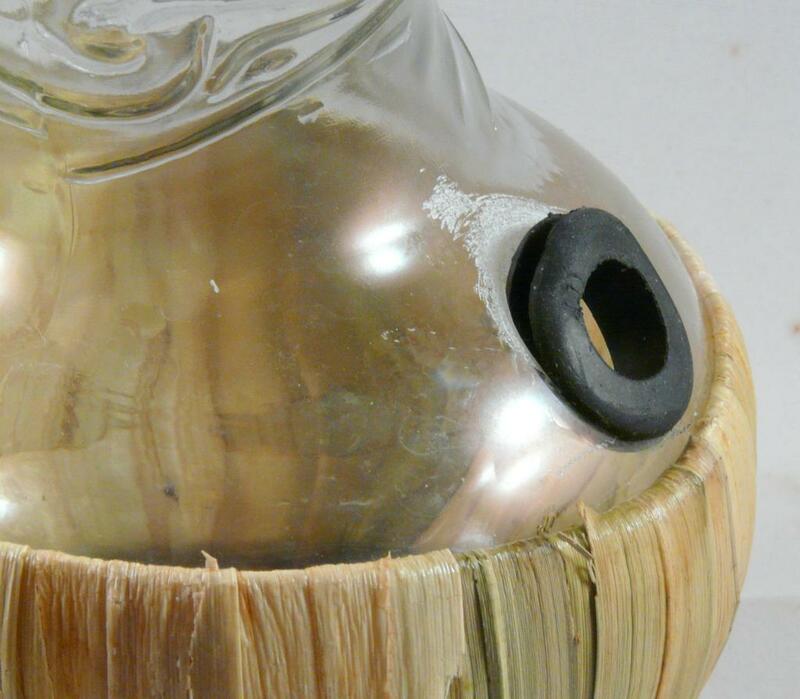 Find the spot you want to drill by placing the gasket on the glass just above the straw covering, and draw a circle around it with a Sharpie or similar. If you’re using one of the recommended liquor bottles, most of them have a dedicated round area that’s ideal and obvious for drilling. Simply pry off the plastic cover with a flat screwdriver first. Now, place the bottle in the sink so the mark is below the faucet, and run some warm water over the mark. It shouldn’t be either pouring down or barely trickling; you just want a steady stream of moving water flowing over your work area. This also helps carry away glass shards before they can fly around. With one hand, hold the bottle firmly by the neck (on the Bottaro, that’s the top twisty section :-). With the other, get your drill running at about 3/4 of maximum speed. When it’s spinning well, center the bit on the mark and hold it on the glass. Don’t push too hard; just keep a steady light pressure and let the spinning bit and weight of the drill do all the work. Make sure you’re drilling at a 90 degree angle to the glass so that the entire surface of the saw contacts the glass at the same time! It is possible to drill at an off-angle to the glass, but not recommended. This is why you need a bottle with a flattish spot and proper slant. It will only take about 2 or 3 minutes to go through the glass. Don’t rush it, but watch carefully. When you start seeing swirls in the water on the inside of the glass, you’re almost through, so ease up the pressure a little but keep the speed going. Once you cut through, use the bit to grind away any sharp edges you see, and then carefully pour the water out. Try to keep track of the piece of glass that used to be in the hole, so it doesn’t go down your drain and mess up your garbage disposal. Rinse the entire inside and outside of the bottle several times to get all the glass powder out before you start inhaling it! Break off any possible sharp pieces of glass with a pair of pliers, then put the grommet into the hole. Work the edges of the grommet around the glass. 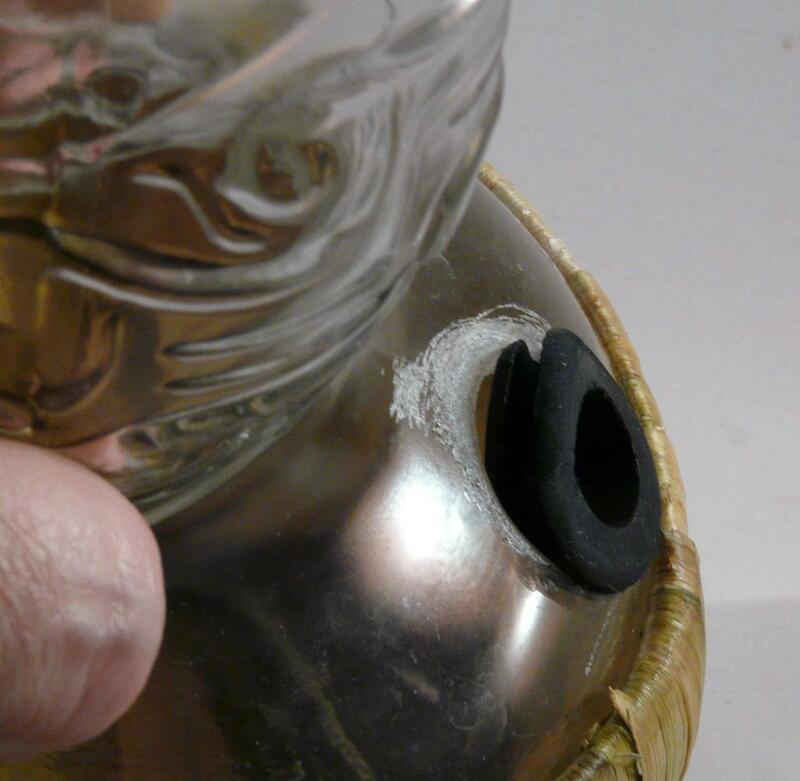 Put some water on the body of the downstem for lubrication, then slowly and carefully push and turn the downstem into the grommet (hopefully without popping the grommet out into the bottle itself). Now put the bowl into the downstem. You’ve reached 11 and you’re done! Congratulations! Now you definitely deserve to smoke a bowl or two! I suggest putting all the tools and such away first though. 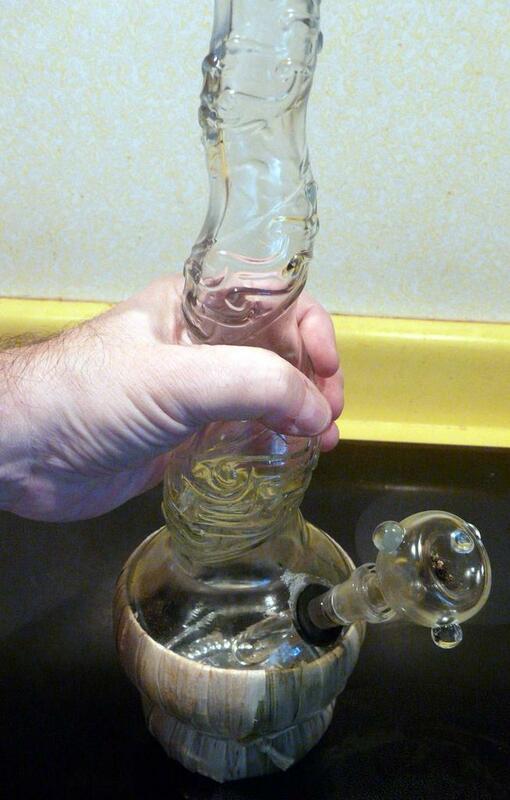 If you’ve never used a bong before, make sure you pack a small bowl…you won’t believe how well it works! If you don’t even know how to use a bong…that’s what Part 4 is all about! I’ve got a tip for sliding in the downstem. Put a bunch of hand sanitizer on the grommet and the stem, and it’ll slide in like butter, especially those delicate diffuser ones. Just wash off with hot water. Hello 🙂 I used your steps and parts and made this, http://www.reddit.com/r/trees/comments/193twe/this_is_shrek_i_made_him_myself/ I love it! Thanks so much for your tutorials, it was hard to find bit sizes anywhere else. Wow, really nice! I’m so happy my articles helped someone. Just be careful of that thing, it looks so…fragile. It’s very fragile, I was mostly doing it to see if I could do it. It’s going to be more of a decorative piece. Your tips helped a lot though, I thought for sure this would break. What length downstem did you use for the Makers Mark bong? I have my bottle, and I’m waiting on my bit to come in, so I want to go ahead and order the glass too. Great article! Thanks! Hey, sorry for not getting back sooner, I was wiped out last night. The one I used for the large Makers Mark bottle was 5 1/2 inches. Nugs and hugs! Can I use a bit sized at 1/2in? You can, but it’s not going to be large enough to fit a downstem and grommet. Came across this awesome video, and I just so happened to run into this exact bottle (minus the straw bottom) at one of my local thrift stores filled with black, red, and pinto beans.. It was gonna cost $8, but after the 70% discount, I got it for only 2 BUCKS.! ? I ordered all the materials two days ago, now it’s a waiting game.. The Corning Bit is gonna take the longest though, but it’s cool.. ? You’ll love it! And then you’ll look at every piece of glass differently! Thank you! Teaching is what I do! Nugs and hugs! I’m not that naturally crafty of a guy, but this is super helpful. One thing that I seem to have missed though — diamond tipped hole cutter. Is that also something I can get at a hardware store? No, but I think Part 2 told you where to find it. Would it be possible for you to leave a link to where get the diamond drill bit, I’ve been searching the internet all day and I’m a little unsure whats best to get. This one is very affordable and has great reviews also amazon prime shipping is always a bonus!